This is the 46th year of my career as a diplomat, and the 10th year as Chinese Ambassador to the UK. Many British friends asked me what has impressed me most during my tour of duty in the UK? My answer is: the successful state visit by President Xi Jinping to the UK in 2015. This visit was memorable not just because it was the first time for me to receive a head of state from China as Ambassador. More importantly, this historic visit ushered in the China-UK "Golden Era". It also charted the course for China-UK relations in the second decade of the 21st century. "The path that the Chinese people follow has been a choice of history. What the Chinese people want is a better life. What the Chinese people long for is a world of peace and development." He also said that "China will stand firm with all other countries to meet whatever challenges that may lie ahead", and that "roads will only become broader when more people travel on them". These powerful words reflect a strategic thinking. They embody the oriental wisdom that values the common good, inclusiveness and mutual learning. They also demonstrate President Xi Jinping's vision, courage and responsibilities as a leader of a big country. In recent years, the increase of media reports on China has been exponential. But to be frank, these reports are not all of good quality. There are more negative voices than positive ones. China's development is regarded as an opportunity by some but a challenge or even a threat by some others. So, where is a richer and stronger China headed? How will it influence the world? To these questions, Xi Jinping Thought on Diplomacy has provided the best answer. To understand today's China and China's diplomacy, one must study and try to understand Xi Jinping Thought on Diplomacy. 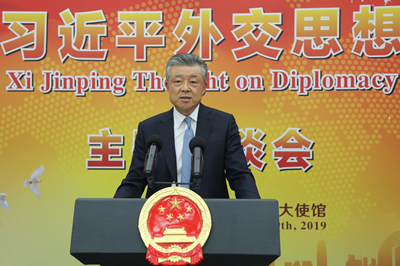 Last June, I attended the Central Conference on Diplomatic Work in Beijing, where Xi Jinping Thought on Diplomacy was established as the guiding thought that provides basic principles and guidelines for China foreign policy. 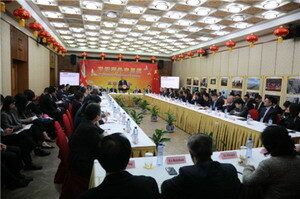 It is an innovation, a breakthrough and a leap forward in the evolution of the thought on China's diplomacy. First, Xi Jinping Thought on Diplomacy inherits and develops China's cultural and diplomatic tradition. And because of our belief that "all under heaven belong to one big family", we are convinced that countries should always come to each other's assistance and work towards the same direction. These are the traditional Chinese wisdoms behind China's diplomacy. This year marks the 70th anniversary of the founding of the People's Republic of China. In the past 70 years, we have formed the diplomatic tradition with unique Chinese features, namely, independence, peaceful development and win-win cooperation. In 1976, I was a young diplomat in Zambia, where I had the honour to attend the handover ceremony of Tazara, a railway linking Tanzania and Zambia. More than 60 Chinese workers sacrificed their lives for building Tazara and were laid to rest on the African continent. Tazara highlights the value of putting righteousness above material gains. It embodies the spirit of equality and win-win cooperation. These ideas have always been deeply embedded in China's foreign policy. Following the adoption of the policies of reform and opening up, China came to the strategic conclusion that peace and development were the theme of the times. This fundamental judgment continued to be the bedrock of China's diplomacy up to and after the 18th National Congress of the Communist Party of China. At the same time, China's diplomacy has also kept abreast with the changing times and made new progress in line with the evolving landscape abroad and reality at home. We have put forward a number of new ideals, proposals and initiatives that are imbued with Chinese characteristics, embody the spirit of our times and provide guidance to the progress of mankind. 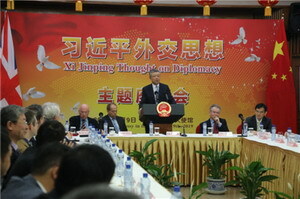 Second, Xi Jinping Thought on Diplomacy encapsulates the concepts and practice of China's diplomacy. At the centre of Xi Jinping Thought on Diplomacy are ten key concepts known as ten "persistent efforts". These concepts are the essence of China's diplomacy that are extracted and distilled from China's long-held principles and decades of practice. This lofty goal of China's diplomacy in the new era has been written into the Constitution of China and the Constitution of the Communist Party of China. It is also endorsed in the documents of important regional and international organisations including the UN. BRI is the overarching design for China's opening up and international cooperation and will remain so for a considerable period of time to come. This is an important measure to open up China wider to the world in the new era. More than six years after it was proposed, BRI is becoming the most popular public goods and largest platform for international cooperation. This is a basic principle that must be upheld in China's diplomatic initiatives on a long-term basis. Peaceful development is a path to common development. It is leading to a new type of state-to-state relations. The third perspective of my understanding of Xi Jinping Thought on Diplomacy is that it provides an assessment and definition on the development of the world and the role of China. China's hard work over the past decades has not only brought about a better life for its more than 1.3 billion people. It is also an important contribution to peace and prosperity in the world and the common interests and benefits of people of all countries. The year 2018 marked the 40th anniversary of China's reform and opening up. In the past 40 years, China's GDP increased by 33.5 times, and its total export and import increased by 782 times. Reform and opening up have not only transformed China profoundly but also brought about historic changes to the relations between China and the world. As President Xi Jinping pointed out, "China will do well only when the world does well, and vice versa." Born against this backdrop, Xi Jinping Thought on Diplomacy gives a global significance to the Chinese Dream. It emphasizes ever close ties between China and the world. It advocates the ideal of "one world, one family". Xi Jinping Thought on Diplomacy is based upon the belief that "it is our duty to work for the common good of all people in the world". That is the rational behind the concept of building a community with a shared future for mankind. What kind of a world do we desire? What should we do to build a world that we want? Instead of minding one's own business and rocking the boat, the international community should come to each other's aid and row together. Instead of taking a "beggar-thy-neighbour" approach, we should stand side by side in time of hardship. In the past 500 years, there were 16 cases in which a rising power confronted the established power. 12 cases ended with war. This has led some people to think that China would not be an exception. In order to bring to an end the old logic that "a strong country is bound to seek hegemony" and "an emerging power and an established power are bound to fall into the Thucydides Trap", Xi Jinping Thought on Diplomacy proposes to build a new type of international relations. With rising instabilities and uncertainties in the world, mankind is faced with increasing and common challenges, and in need of a joint response. This is exactly why President Xi Jinping's speech at Davos back in the 2017 received enthusiastic response from all over the world. In that speech, President Xi analysed the problems in the world economy, endorsed globalisation and multilateralism, and contributed China's solution on global governance. Only in this way will mankind take the future of in their own hands. Now let's come to the third question: how to obtain an accurate and comprehensive understanding of Xi Jinping Thought on Diplomacy? First, Xi Jinping Thought on Diplomacy is aimed at safeguarding and improving the international order rather than replacing the existing system. The current international system may not be perfect, but on the whole it is effective. China stands for reform and improvement, not "reinventing the wheel". We would like to see a more equitable and reasonable international system that meets the needs of the current international situation. China believes that "a country should never sacrifice the greater good for material interests". In our business cooperation with other countries, we follow the principle of win-win results. We do not interfere in other countries' political affairs through economic cooperation or by creating the so-called "debt trap". Later this month, China will host the second Belt and Road Forum for International Cooperation. As of today, China has signed 173 documents on BRI cooperation with 124 countries and 29 international organisations. We have never "forced" any country to cooperate with China. These countries and organisations signed those documents based on their independent strategic judgment and in line with their own needs. Last but not least, Xi Jinping Thought on Diplomacy is aimed at shouldering responsibility rather than "flexing muscles". In the past 70 years since the founding of the People's Republic of China, China has never launched a single war or conflict. China is the second largest contributor to the UN peacekeeping budget, and the largest contributor of peacekeepers among the five permanent members. China has also taken part in the settlement of almost all the hot-spot issues in the world, and has actively contributed China's wisdom and solutions. Thoughts have always played a crucial part in leading the development of history, in making the achievements of civilisations and in promoting the progress of mankind. Xi Jinping Thought on Diplomacy is the "compass" for China's foreign policy. It demonstrates China's sincerity to join hands with other countries to create a better future for mankind. It will ensure that China takes the right side of history and its interactions with the world heads in the right direction. I hope that your earnest study and accurate interpretation of Xi Jinping Thought on China's Diplomacy will help strengthen the bond between the people of our two countries, and enhance mutual learning between our two civilizations. I look forward to your wisdom on how to seek common progress for China, for the UK and for the world, and I count on your contribution to the building of a community with a shared future for mankind!